The Songkran Festival in Thailand is an annual festival that takes place during Thai New Year, the festival is observed for three days (i.e. )April 13th-15th. Although Songkran is a three-day festival, it is celebrated for the whole week. A wild scene of effervescence will be seen throughout the festival with dancing, music, drinking and folks being drenched from their head to toe. Hose pipes, Water guns, buckets, you get everything you need. It can be used for splashing people and one thing is for sure, you will get wet! 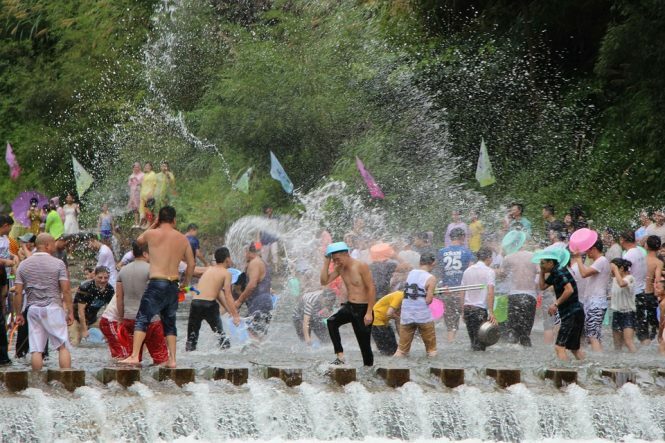 Since April is seen as the hottest month in Thailand, people from all over get involved in the water fights and it brings a great relief from the good temperature. 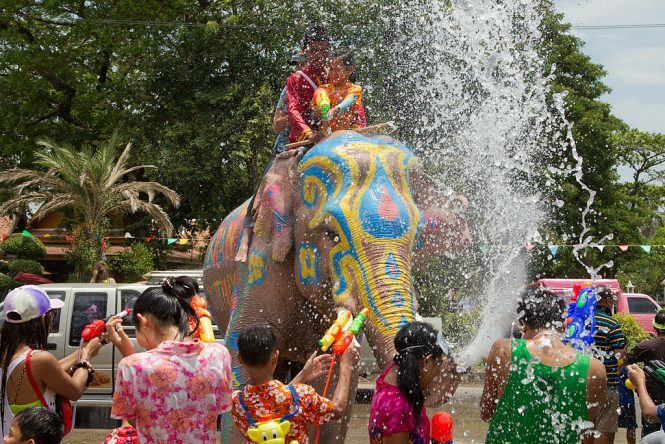 Songkran, a Buddhist tradition, wherein the sprinkling of water that symbolises purification but in the later times, people started splashing on each other in a playful manner, the whole country celebrates water fight all together at one place. Our Thailand tour packages will you to indulge in this amazing cultural festival of Thailand. Thai New Year is coming is an important date to be marked on the calendar for many people. The Songkran festival coincides rising of Aries on an astrological chart and on the New Year as well, for the other calendars in South East Asia. The holiday, however, runs for all the three days (i.e.) on April 13 – 15. The word Songkran is derived from Sanskrit, which is literally translated as an “astrological passage”. The celebration is marked as an end of a 12-month period and a commencement of a new year( solar year), as the sun seems to move into Aries in the month of April. 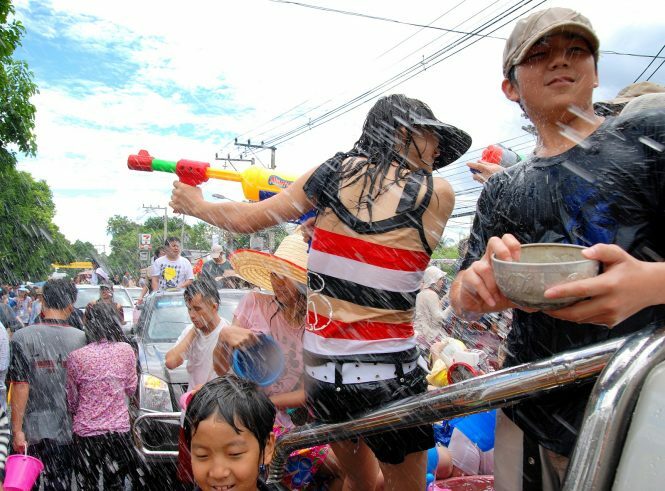 Thai people connected New Year with the Western culture, that coincides on January 1, but the Songkran festival in Thailand is also regarded a national. In the central zone, people keep their houses clean and get ready for the New Year celebrations, while adults and children get dressed in colourful clothing and magnificent hues. 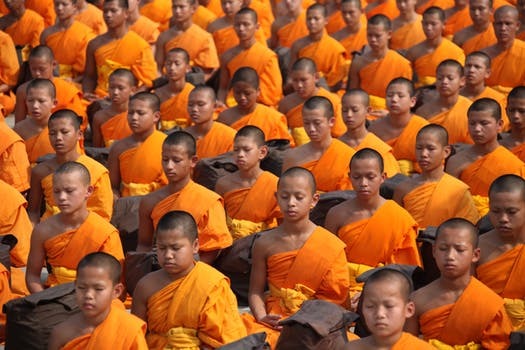 The monks are given/ offered food on that day by Thai people, as a belief of requiem to the ancestors. People others release fishes and birds, or other larger animals, like cows and buffalo. Songkran is an occasion for all the families rendezvous, they visit temples, keep their houses tidy. Rod Nam Dum Hua ritual is performed on the first day of Songkran, that is officially a national day for elderly people. Youngsters pour water in elder’s palms, fragrant waters, asking elders to bless them. Second, say is considered as Family Day ( nation-wide). However, in South, there are three typical rules: One must save money, they should not lie nor hurt anybody. Meanwhile, in the north region, local people will light firecrackers toward the bad luck of their lives. The festival is seen in the hottest period of the year, in Thailand, during the end of a dry season with the temperature rising over 40°C. On the next day, a variety of dishes are prepared and that food is offered to the monks at the temples. In the east region, Thai people follow the same rituals, while others prepare a healthy food for elders in their communities and families. Foods served at the traditional Songkran Festival depends on the place/part you visit in Thailand. Our Thailand tour packages are the best way celebrate Songkran festival in Thailand. It’s all fun and nothing annoying. One is going to get soaked in water and it is accepted by everyone. If you want to be dry, then it is better to not participate in the festival. One would get daubed in a scented powder and water made of grey-white paste, which is sure harmless, but it’s better to avoid as it is not good for your eyes. Please carry a waterproof pouch that will protect valuable things. Do not wear a white dress, as it goes transparent when it gets wet in the water! Water shouldn’t be splashed over Monks, as people respect them the most in Thailand, so it is never good to throw water at them. It is better to avoid driving bikes during Songkran. Use four-wheeler transport or go on foot. Please secure your valuables, lock them in your room. Do not swallow the water that is being splashed at you-you never know where it comes from. Wet floors are slippery, one must be so careful. Do use waterproof pouches/bags to protect all your valuable items. Do wish all the locals, a happy new year in Thai. Do smile and have a great time. Do not take babies or the elderly ones. Do not drive when you are drunk. Isn’ t it great knowing about Songkran festival in Thailand? If you visit Thailand anytime in the month of April, one will not be returning without exploring the biggest water fight festival and it is certain that nobody will leave the place without the water being splashed at them, no matter how good you are dressed. So, it is better to be cautious that you leave your best dresses at home/ hotel. One must also take care of their passports and electronic gadgets as it is the world’s biggest water festival and the water is permeated in every corner. International flights will be arriving at Suvarnabhumi Airport, which is for about 20 miles away to the east. Don Muang, the old airport is 12 miles to the north will handle domestic flights. Skyscanner got return flights directly from London Heathrow to Bangkok for different prices with China Southern, Thai Airways and Swiss Airways. 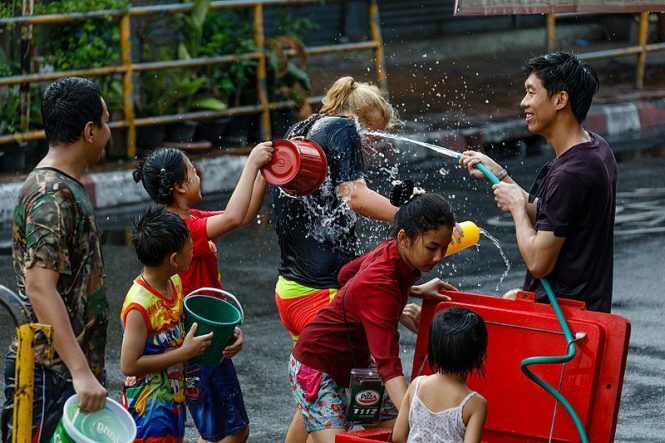 Tourists are treated very special during this festivity and the children in Thai will put efforts to splash cold ice water down its visitors dress if they see you passing by.